I got a phone call on Sunday from an excited and now world famous Geoff Preston who had just filled his 3.6 metre Mac boat with huge Mokau snapper. Geoff and his mate Justin had fished five to seven kilometers out from the beach and they used straylines and ledger rigs fitted with big hooks baited with half fillets of fresh kahawai. The massive fish quickly filled both available chilly bins and they had to bring in the rest of their limit catch as a deck load through the rising easterly winds and surf. Geoff reckons the tiny Mac dinghy handled the worsening conditions very well. The size of their fish ranged from 5kg to 11kg with several over the around 20 pound benchmark. 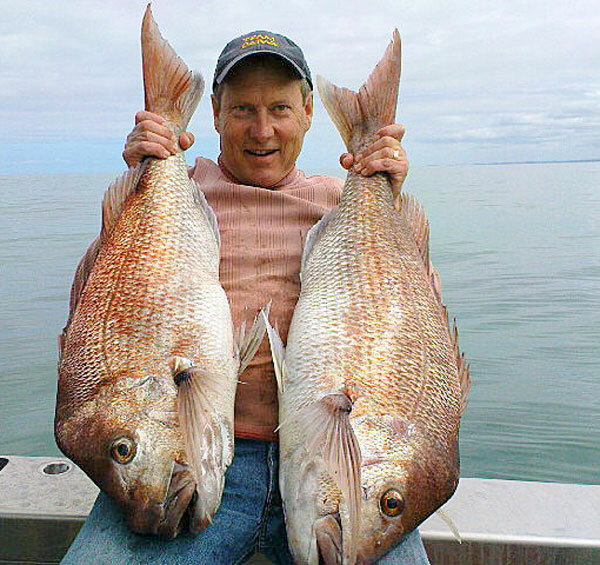 Keep an eye on the HOOKED programme on the Discovery channel to see Geoff Preston catching big snapper at Mokau. A new second series which focuses on catching really big fish has already screened in America. Geoff's episode should feature in New Zealand and Australia early next year. A new shipment of flounder lights has arrived. Due to the strength of the New Zealand dollar we have been able to reduce the prices on these top of the line LED Lights by over 25%. These premium quality lights are super bright and waterproof to 10 metres. Besides being the best flounder light we have ever seen, the waterproof design makes them great for on the boat as they have an SOS and strobe function and hold a charge for over a year. 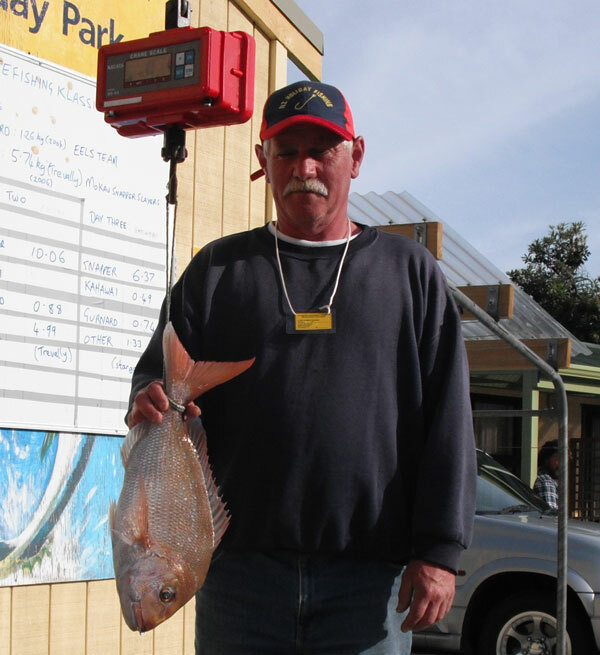 The Karikari Kitefishing Klassic was held from the 18th to the 21st November at the Whatuwhiwhi Top 10 Holiday Park. This year I jumped at the chance to attend this event, my first time ever and I’m so glad I did. Barry and I arrived around noon on Wednesday and got settled into the self-contained unit before checking out the local beaches. The beach right in front of the Holiday Park would be tops for rock fishing or, if you’re a kitefisher, a small dropper rig with floating baits. Scattered offshore rocks would cause problems for any other system, but the locals seem to navigate them easily from the boat ramp there. Just around the corner, north of the Park, is another small beach. No boat ramp there, but loads of shellfish and rock oysters and, just a small walk over a hill to the right of the beach you find yourself in a tiny rocky bay. A real rock fishers’ dream come true. After taking in some local sights it was time for the briefing. Wow, what a blast from the past! It was so great to see so many old faces, and of course, to meet so many new people too. Evan McKay ran through the contest rules with a crowd of 40 kitefishing teams, most made up of three or four team members. They had obviously put a lot of thought into the rules. I was most impressed with the fairness, the sensibility and most importantly their focus on conservation and being eco friendly. For the benefit of those who had not attended before, Evan gave a brief run down on the history of the kitefishing contest. Seven years ago they began with just 28 teams, but as the popularity of the contest grew over the following couple of years, it quickly had to reach a cut off point with 40 teams. This years entries were sold out well in advance, and in fact, with two teams having to pull out at the very last minute, their spots were filled within hours. It was lines in the water at 6:00am. Now I’m an early riser, generally up around 5:30am, but when I awoke on Thursday morning there was not a soul in sight. Apparently most hit the beach to claim their fishing spot no later than around 4:00am! The rules were that every team had to be at least 300 metres apart, could set a maximum of 10 hooks per line and only one line per team. As southwest winds were blowing, all fishing was to be done from Tokerau Beach. Many fishers had checked out their spots for the contest the night before, even to a point of running a few sets to see how the fishing was there this time of year and which baits the snapper seemed to be favouring. Veteran kitefisher, Colin Sherman, was one such fisherman. He cleaned up while night fishing with about 12 large snapper and a couple of gurnard from his longline rig. How they would all go during the day however was yet to be seen. After a quick cup of coffee and a short stop at the local superette for some ice, we headed off to Simon Urlich road, around one third of the way along Tokerau Beach. The entrance to the beach there had a stream running off to the right, so, without a 4x4, it was shanks pony up the beach with the camera. Stopping to chat with six teams up the beach, we found all were finding the fishing very hard in the morning. Winds were a very fickle southwest, probably hitting close to 15 knots in gusts but big calm spells between. The overcast conditions looked to be ideal though - I was picking there’d be some good fish hauled in later on as the wind rose. As Barry and I weren’t actually entered into the contest we decided to go for a drive and check out Taipa Beach just south of Tokerau and at a slightly different angle. Other than one lone surfcaster at the most southern end of the beach, we had the beach to ourselves. Fishing a 3 hook pocket sled rig from my trusty Okuma spooled with god knows how much 10kg spectra line we ran the first set out to around 600 metres offshore. With such light winds it took near 20 minutes to get the kite up, but once up it was in good clear air and the entire line was held clear of the water. Obviously the gear would have been under-weighted once I’d stopped the reel, but we decided to leave it to fish for half an hour or so anyway. In the meantime Barry brought out his surfcaster to try his luck. Fish were seen jumping just offshore and within range. The bait we had, ARGH, store bought frozen mullet. I should have known better, I know, but hey, beggars can’t be choosers. Must have been okay bait though, Barry nailed a nice kahawai that we quickly dealt to and used for bait on the next set with the kite. By now the winds had shifted around a bit. The kite was heading straight between the rocky point to the right and a group of rocks around 60 metres away from the point. Let’s go for it I said, we’ll take the risk. It was a perfect set, straight in the middle, through the gap, and no snags! More down to luck I think than good management. Still, we managed to pull in one nice pan sized snapper for dinner. Back at the Park it was time for the weigh in and a chance to catch up with everyone. 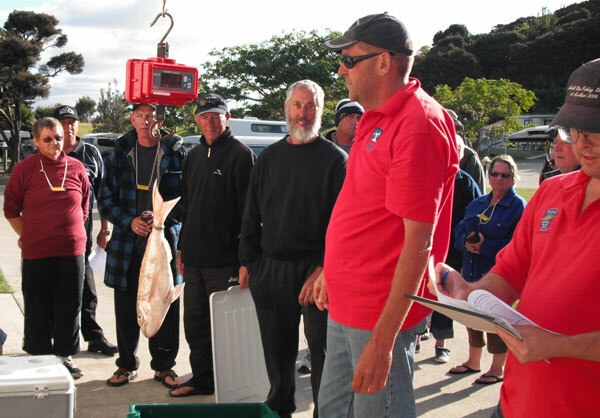 While there were a few teams who wound up empty-handed, many caught a range of good sized snapper, kahawai and gurnard and it seemed the largest snapper were all taken later on in the day. Day two of the contest was much the same as the first. Most kitefishers complained of either returning with all baits intact or having them all stolen by the paddle crabs as their gear stalled in the surf in the light winds. Figuring it would again be hit or miss till mid afternoon we headed back to Taipa. 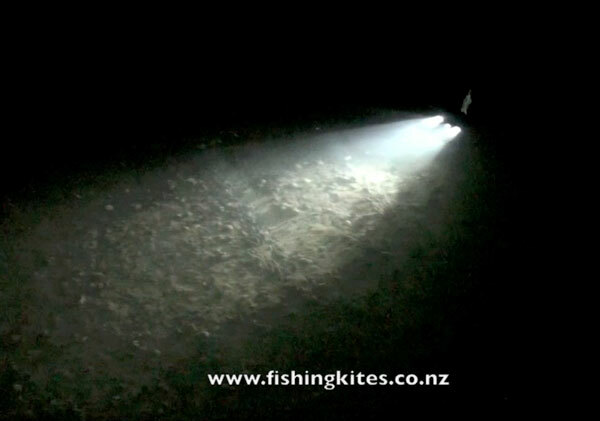 Our first set with the pocket sled and 3 hooks was much the same as those fishing Tokerau, the baits were untouched. As we prepared for the second set though, the winds got up a bit. After a slight adjustment to the sand in the bottle and re-baiting, we fired it out again. This time we let it fish for close to an hour. 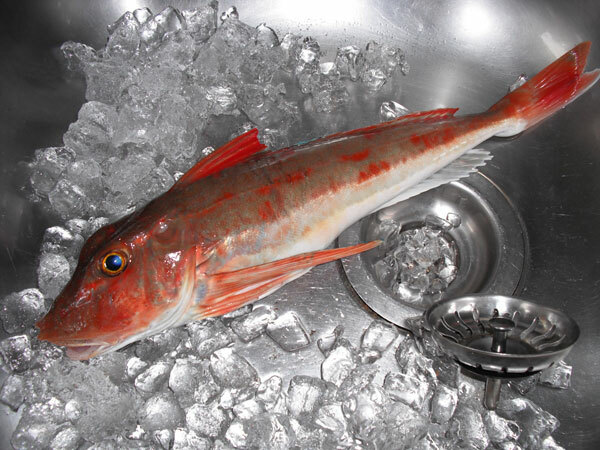 Good call, we wound up with one large gurnard. On the third and last day of the contest the winds changed around to a light westerly, almost imperceptible in the morning. By around 10am though it had increased to a good 15 knots or more. We decided to spend the last day on Tokerau Beach. After spending around 15 minutes trying to tease the kite up in the minimal winds I checked the area we were fishing. Yep, high hill directly behind us and just behind that was a row of very tall trees. Darn! No wonder I was having problems. I then walked down the beach around 200 metres to a clear opening free from wind shadows and the kite took off skyward. Once the kite was up in clear air I walked back to where we had started. Two sets later, no fish. All things considered though it was a great weekend and well worth the trip. Rob from the shop had entered the contest and had managed to catch a few nice fish. For those considering heading north over the summer break, this facility is fantastic! 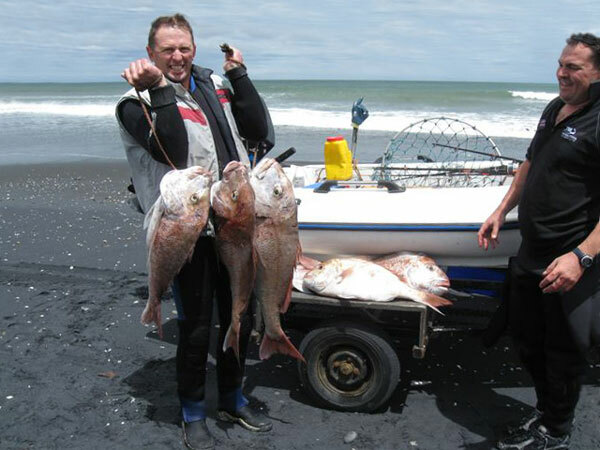 This holiday park is at a great location for fishing Matai Bay, Tokerau Beach, Coopers Beach or, just across through Kaitaia, the awesome West Coast fishing at 90 mile beach or Ahipara. Owners, Jeanette and Harris are absolutely amazing and most welcoming. Thank you so much for your kindness. I am really looking forward coming again next year. It’s been ages since I’ve reported a catch but here is one. We had a good Saturday on the Labour Day weekend setting two 25 hook boat longlines beside a reef off Waitotara, west of Wanganui in 20 metres of water. Dad and I couldn’t believe our eyes when 4 snapper over 10lb came up. The two snapper above were 18lb and 20.5lb. They were in top condition and have provided some very tender and juicy steaks. We filled all the bins with these and some great blue cod and gurnard so couldn’t do a second set. Last Friday fishing out from Whangarei we caught a limit bag of snapper in three hours. 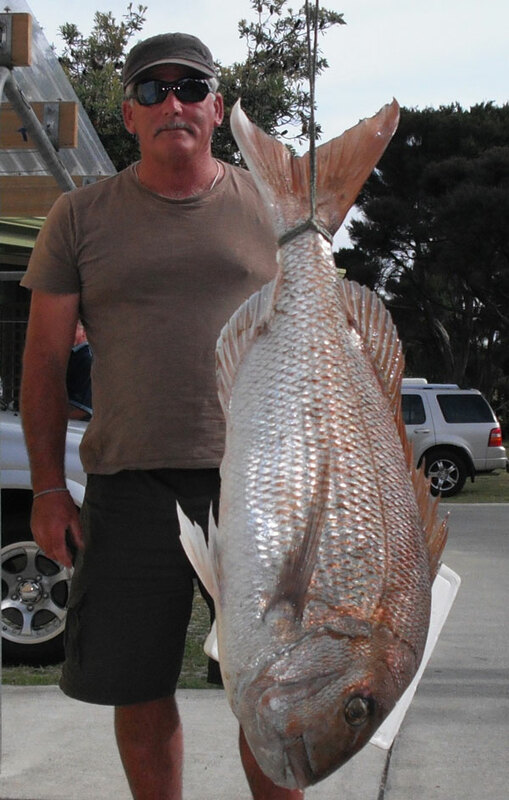 The fish ranged from 1.5 to 5kg and were taken on 10kg tackle and Target Snapper Hooks. The best fish we caught were drift fishing across the outside of the main channel and down toward Ruakaka. The locals reckoned the biggest concentration of schooling snapper were between the Uretiti Golf course and Waipu river mouth. The best fish were on the outside of the schools, very few fish were deeper than 30 metres. We had fresh piper and squid for bait and the best fish were taken on whole squid. The fish were really on the bite and the squid baits were just too big for the smaller fish to swallow. I wanted to provide feedback to your readers and ask for respect for all beach users when using electric kontiki's and kites outside your operating guidance. While jetskiing at Muriwai in approximately two metre plus swells we encountered an electric kontiki which had been set but caught in the strong rips which occur at Muriwai. The users had set-up and launched the electric kontiki directly out from the beach access. While operating our jetski we encountered the electric kontiki and line approximately 300 metres down the beach and 100 metres out from the beach, clearly caught in a strong rip. This is incredibly dangerous as the line and kontiki were riding over the waves meaning the nylon was at times at head height while operating the jetski. This has the potential to cause major injury from the nylon and also potentially the hooks trailing in the water. On another occassion I have seen a kontiki set and caught in a rip with surfers in the same location. Being a passionate kitefisher myself I know that while also being dangerous to others, the fishing results are generally poor anyway when a rip takes either a kontiki or kitefishing gear to such an extreme angle to the beach when caught in a rip. We all wish to use the beach and benefit but we should do so respecting the safety of others. You have very responsibly outlined the ideal conditions and places to operate electric kontikis on your website so we ask could electric kontiki operators follow these guidelines. If you could provide this via your forum or newsletter it would be greatly appreciated. Hi , I have recently been employed by the ARC to undertake the Vehicles On Beaches campaign based at Muriwai beach. We are not aiming to eliminate vehicles but eliminate accidents and minimise environmental degradation. We now have a diverse range of user groups on the beach from dirt bikes, 4wds, kite boarders, horses, dog walkers, to families picnicking, you name it, they're here! This causes some conflict as you can imagine! In an effort to guarantee safety and minimise user conflict and environmental damage, we are undertaking an education campaign to deliver to schools and user groups. We advise all long liners, kontiki and kite fishers to use cones on the beach so that lines are visible. Vehicles should also be parked off the main thoroughfare, as these areas do get very busy at peak season. Due to our erosion problem on the coast and the dune restoration work that various groups have done, dunes are out of bounds so please keep off them. Some points have been left open to allow for parking out of the high tide mark. In a nutshell, road rules apply to all coastlines. At the entrance to Muriwai beach from Coast Rd, no vehicles are permitted south, speed is restricted to 30 km/hr for 650m north and is then 60km/hr. Legal entrance points are at Coast Rd, Rimmers Rd and Wilsons Rd, all other access points will be closed. The bombing range area is strictly prohibited to vehicles as there are un-detonated missiles in the area, and we would rather no-one finds them by accident! We have a handbook coming out shortly that I will pass on to you for your members. If all users are considerate of everyone's right to our beautiful coastline fewer rules and regulations will be needed!